The National Nordic Foundation is seeking the position of Director of Operations. Support the National Nordic Foundation (NNF) and win great gear and amazing experiences at the same time. James Southam has been executive director with the NNF since 2014, but his role supporting the organization goes back farther than that. The former Olympian announced he will move on from the NNF. 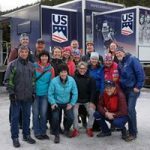 In an effort to extend its reach in supporting Nordic sport athletes, the National Nordic Foundation Board of Directors has approved the NNF National Development Project, a new funding program aimed at improving American skiing through clubs, camps, and coaches and officials education.